Are you considering filing for divorce in Lake County IL? If you are currently planning on pursuing divorce or are facing any other family law issue, you know how emotionally draining these situations can be. Divorce can have a tremendous impact on the future of everyone involved and it is extremely important that you have high quality legal representation protecting you, your rights and your personal and financial interests. With a top-rated divorce lawyer from Hoffenberg & Block LLC, you can have confidence that your case is in capable hands. Our experienced team of Lake Forest IL divorce and family law attorneys serve clients throughout Lake County, including Highland Park, Highwood, Lake Forest, Bannockburn, Barrington, Buffalo Grove, Deer Park, Deerfield, Grayslake, Green Oaks, Gurnee, Hawthorn Woods, Kildeer, Lake Barrington, Lake Bluff, Libertyville, Lincolnshire, Long Grove, Mettawa and the North Shore suburbs. Our firm has been recognized by Best Lawyers, US News and World Reports as “Best Law Firm in Chicago” and four of our exceptional family law attorneys have been honored with the designation Super Lawyers in Illinois. 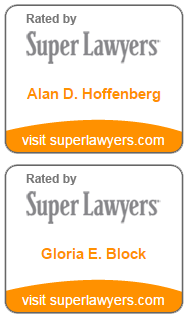 Super Lawyers rates lawyers who have attained a high-degree of professional achievement. Attorneys are selected based on a rigorous, multi-phase rating process that includes peer nominations, evaluations and third party research. Searching for a lawyer for a Lake County IL divorce case? We can stand by your side during this difficult time. When you choose to work with our firm, you will be working with professionals who have over 100 years of experience in dealing with complicated family law issues. No case is too complex for our firm to handle. Whether you contact our Lake Forest or downtown Chicago office, you can feel confident in knowing that you will be working with an experienced family law firm that has been listed by Best Law Firms in Chicago for the practice area of Family Law. Schedule a no obligation case valuation in our Lake Forest Illinois office, conveniently located at 500 N. Western Ave., Suite 214, Lake Forest, IL 60045. The office’s direct phone number is (847) 901-7170.